Kumo let all the shurikens pummel into him, he then fell to the ground, thousands of spiders crawled from his corpse...He then reformed right behind Rave, "I must say, you are rather entertaining..." Kumo licked his lips evilly..."To be able to keep up with me is amazing to say the very least...but you will never defeat me, You may ask anyone who is here...You couldn't defeat even the weakest member of the Higure...But please do not take offense, I wish to make use of you...I wish to make you more powerful, I wish to make you one of us...But the question is, are you willing to learn..."
as rave heard his words a slowly start to turn more human like and said "teach me i want the power and the abilltty to be strong please"
as he finaly fails to one knee coughing up blood from the poison thinking to my self "i tried iam at my limit"
Kumo chuckled as he placed a hand onto his shoulder, his hand opened up, a hole forming in his palm...it then sucked the venom from him..."You will be trained by us, once your training is complete you will be placed in a trial that we will speak of when the time comes...As of now I will be the only one to train you, unless the others would like to aid." Kumo chuckled, "How flattering..." He said with a deliciously evil smile, he moved his head slightly downwards as he licked his lips. "I am the infamous Kumo-Kukuou Monsuta..."
Kumo chuckled, covering his laugh by cupping his right hand over his lips...He removed his right hand and placed it at his side, licking his lips as he flicked his hair around so that it would land in his face, covering his face from Rave's view...He looked down at him, an evil grin spread across his pale face, being barely visible through his thick black hair..."We make you stronger...I want you to defeat one of my minions...If you are incapable of doing so, then we have much work to do..." Kumo clapped his hands together, he began preforming hand seals, during one of the seals he brought his hand up to his face. He then bit his thumb, breaking the skin and causing him to bleed. He wiped it across his opposite hands palm and brought it down to the green forest floor...Suddenly a dark purple smoke cloud poofed into existence, the smoke was highly poisonous...Once it cleared a large Arachnid creature stood before Rave..."Welcome the Arachnid of power..." He grinned evilly...The Arachnid let out a ferocious roar, pounding it's four arms against it's own chest...It pointed at Rave with two arms and grinned evilly... "I will crush your bones into dust!" The Arachnid yelled triumphantly. Rank A - Arachnid of Power - The user preforms quite a few handseals, then cuts himself to offer his own blood. 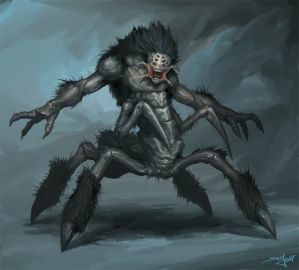 He then summons an arachnid ally who focuses on strength and power, he is rather slow but is large and durable. Kumo's spider put two of it's hand together, preforming a few handsigns so that he could use a somewhat advanced earth technique. The attack couldn't harm him while this technique was activated, making him invincible for the time being....The Spider then threw it's other two arms that were not preforming hand signs into the oncoming Rave. Description: After a quick few handseals, the user's skin becomes nearly unbreakable and turn to a dark earth like color for a short duration of time. The Spider chuckled, it had pulled off two jutsus due to the four hands it had....It laughed madly as it's skin became a dark brown, it was invincible...The Spider then cocked it's heavy fist back and pounded it towards the Phoenix and Rave. Description: After a quick few handseals, the user's fists become unbelievably hard, the user then is lunged by his own chakra towards the enemy so that he may attack them. Description: After preforming a string of handseals, the user cups his hands over his mouth. Sending out a large wave of wind from his mouth.